By Quincy Troupe, Hyperion Books for Children. Ages 9-12. 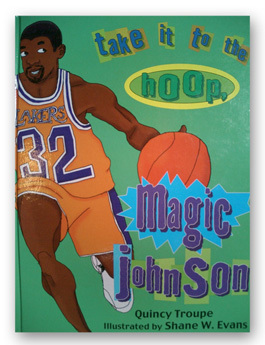 This tribute to Magic Johnson honors the true artistry of Johnson’s game. Quincy Troupe’s fast-paced poetry, full of basketball phrases and images, together with Evans’s vibrant, cartoon-like paintings, make basketball jump right off the page. Remember why he’s called Magic!